The Kamakhya Temple along with a network of temples dedicated to the Mahavidyas and other deities located on the Nilachala Hills in Assam is one of the world’s most important sites of goddess worship. On the Nilachala hills, peetha of the great Goddess Kamakhya is located, surrounded by the peethas and shrines of Mahavidyas, other Goddesses, Pancha Shivas, Ganeshas, Vishnu, other deities and numerous sacred sites, scattered all over the hill. This makes the Nilachala hills a sacred complex and one of the world’s most important sites of goddess worship. The place that popularly known Kamakhya, actually is a hill system comprising of three segments (i.e. Brahma, Shiva and Varaha hill) referred to in the scriptures as Nilachala, is also referred variously as Kamagirii, Mahagiri, Kamakhya Yonimandala and Kamakuta. This is thus the installation of a delicately conceptualized and intrinsically interconnected network of peethas, shrines, sacred ponds, other sacred sites, etc. keeping Kamakhya temple as the focal point. Hence, use of the phrase Kamakhya Temples’ Complex of Nilachala hills instead of just Kamakhya is more appropriate for a better understanding of the site. The peethas of the other Mahavidyas (except Goddess Tara), Pancha Shiva and other Goddesses are identically similar in nature to that of the peetha of Goddess Kamakhya. In fact, inside a dark cave or the garbhagriha (sanctum sanctorum)of the Kamakhya temple, peethas of three Mahavidyas of the Dasa Mahavidyas are located, i.e. the third Mahavidya Tripura Sundari or Sodasi known as Goddess Kamakhya, the ninth Mahavidya Matangi (Goddess Saraswati) and the tenth Mahavidya Kamala (Goddess Laxmi). As a pilgrimage center for Hindus, Buddhists and practitioners of various streams of Tantrism for well over a thousand years, it has developed a uniquely syncretic religious culture. Millions of devotees from all over the world visit the Kamakhya Temples’ Complex every year. The sites of Shakti worship and the rich tradition of Kulacara Tantra Marga has created a unique blend of religious system in the Kamakhya Temples’ Complex located on the Nilachala Hills. 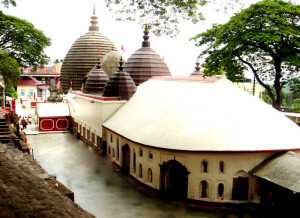 The unique system and tradition of different modes of Shakti puja, rituals, and festivals are observed and celebrated in the Kamakhya Temples’ Complex reflects the very essence of its beauty and creativity, as well as the lyrical and rhythmic style of the system and tradition. Religious literature says that the temple of Kamakhya was built with stones by Kamadeva with the guidance of the celestial architect Biswakarma and was full of architectural and sculptural genius. Perhaps due to some upheaval against religion or natural disaster, the upper part of the temple was destroyed. The original stone temple was covered with carved images of sixty four Yoginis and eighteen Bhairavis and one can still find the images in the present temple. Various rulers and kings in different periods have added their creative imaginations to the original temple and the present structure is a mixture and assimilation of architectural styles hailing from different periods and dynasties. Through the ages, various rulers worshiped the deities of the Kamakhya Temples’ Complex, and they either invited or brought families of scholars and priests from various parts of the country to perform the rites and rituals associated with the deities and sacred sites. The royal patronage of Shakta Hinduism prevailing in the form of Kulacara Tantra Marga of Kamakhya Temples’ Complex became dominant over the other forms of worship in Kamarupa and its surrounding areas. Departments of geo-sciences and archaeology as well as several eminent scholars have suggested that the present day temple of Sri Sri Kamakhya was originally constructed in the 8th century during the rule of the Pala dynasty in Kamarupa. 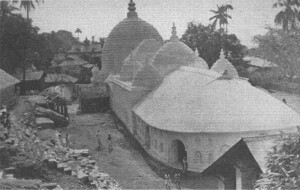 Sir Edward Gait in his book A History of Assam wrote that the Kamakhya temple was originally built during 4th-5th century CE. Another suggestion has also evolved from a radio carbon isotope testing conducted to determine the age of the main temple and the results indicated that the bottom layer of the temple is approximately 2200 years old, and the second layer is around 1500 years old. Thus we may assume that a temple stood on this site as early as 200 BCE and an attempt was made to rebuild it around 500 CE. The Kamakhya temple complex is mentioned as a famed pilgrimage center in the 8th century Hevajratantra, the 9th century Kalikapurana, 16th century Yoginitantra and 16th Century Kamakhyatantra. These ancient text mention the Yonimandala on the Nilachala Hills and describes the inseparable link between various Peethas and deities of the Yonimandala and their worship. King Biswasingha (1515–1540 CE) rebuilt the original temple at Kamakhya. Though there is no surviving material evidence, it is assumed by some historians that the temple was destroyed by the invading Muslim commander Kalapahar in 1553 CE, during his crusade against Hindu temples. After the cruel destruction of the temple by Kalapahar, King Naranarayana (1540–1587 CE) started rebuilding the present temple in 1555 A.D. and completed the work in 1565 CE. Under the rule of the Ahom dynasty from the 17th to 19th centuries, the Kamakhya temple complex expanded and flourished, with a considerable number of temples constructed for the Mahavidyas, various forms of Shiva, Ganesha, and other deities. The history of the Kamakhya temple complex is obscure and inter-mixed with oral history, mythology and legends through the advent of the Koch Kingdom. The story of the creation of the Yoni Peetha or Yonimandala on the Nilachalaa Hills and the story of Naraka (a king of Pragjyotispura) as mentioned in the Kalikapurana and Yoginitantra are significant. Apart from these texts, detailed reference on the Kamakhya temple complex and its unique religious tradition can also be found in other epics, Puranas, Tantras, etc. 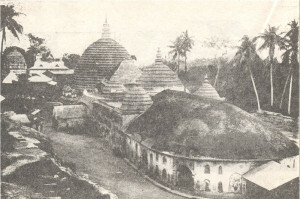 Moreover, some references to the unique history and heritage of the Kamakhya Temples’ Complex can also be found in the works of various historians and scholars.